Vimeo today announced a new "Vimeo for macOS" app that brings some of the service's core functionalities to Mac computers, particularly aimed at creators using Apple's Final Cut Pro video editing software. 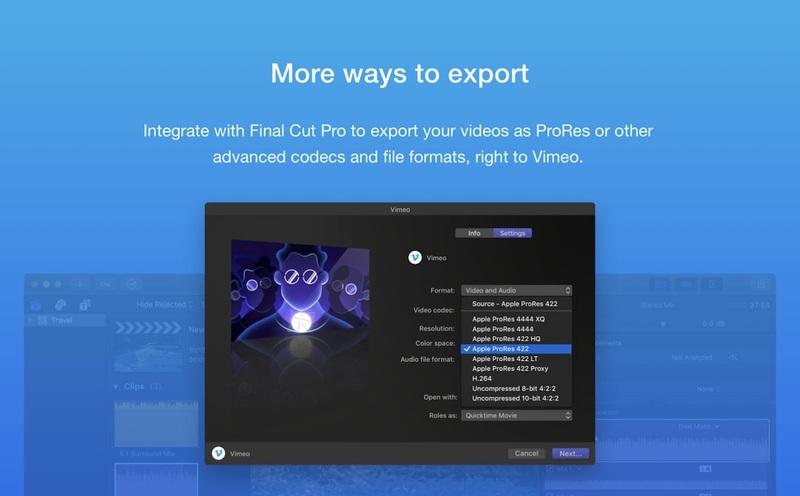 While users could already upload to Vimeo from Final Cut Pro, the company noted that its new Mac app gives Final Cut Pro users "more control over file formats and video codecs." Specifically, Vimeo will integrate with Final Cut Pro to export ProRes videos, manage uploads, share videos for team reviews or to post on the platform. Vimeo said users will also be able to upload multiple files at once, track upload progress in the Mac status bar, and more. The company hopes that the Mac app will streamline creators' workflows by simplifying the export and upload process. 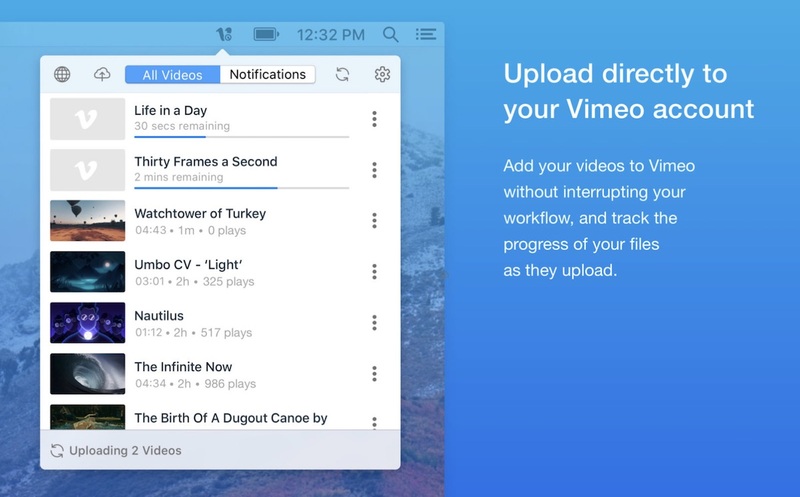 Once the new Vimeo app is installed users can connect to Final Cut Pro by restarting Apple's app and looking for Vimeo in their share destinations. The company also mentioned that it plans to provide ongoing updates to the Mac app, and is open to feedback from the creator community. Final Cut Pro updated yesterday with version 10.4.1, introducing the new ProRes RAW format. Apple said that this format combines the visual and workflow benefits of RAW video with the performance of ProRes, a lossy video compression format developed by the company for post-production. The update also added advanced closed captioning tools and enhanced export tools. Vimeo for macOS launches a few months after the company announced support for high dynamic range videos on its apps for iPhone X, 2017 iPad Pro, and Apple TV 4K. Vimeo's HDR videos support the High Efficiency Video Coding (HEVC) format to keep file sizes at manageable levels, letting HDR video makers upload to Vimeo "in the highest color accuracy possible." Those interested can download Vimeo for macOS for free from the Mac App Store [Direct Link]. Interesting tool which I would have found useful. Their web uploading process is such a hassle. Interestingly enough, I'm a professional creative who closed my Vimeo account of over ten years just a week ago.